I think green beans just may be my favourite veggie! For a long time, it was broccoli, but I’ve been using green beans more in recipes and I can’t get enough of them! I discovered this simple recipe in Sobey’s free magazine, Inspired. I love how quick it is to whip up for a side dish. If you are having a barbecue, this would be a great addition. It’s nutritious, flavourful and fresh. June seems to be the best month to buy local green beans in our area. I bought organic green beans that were already trimmed and triple washed at the grocery store. There’s slim pickins’ right now for green beans at our grocery store. Guess I’m about a month to late! Oh well, the salad still was amazing! If you are looking for more green bean recipes, check out my recipes for Green Bean Casserole, Southern-Style Green Beans, Garden Vegetable Beef Skillet, and Chili Buttered Green Beans & Almonds. What’s your favourite green bean recipe? Fresh, flavourful and nutritious! Serve this healthy salad alongside your fave dish. Cook green beans in a large pot of boiling water for about 2 minutes. Drain and rinse under cold water to stop the cooking process. Pat dry and transfer to a bowl. Mix in tomatoes, shallot and basil. Whisk oil, vinegar, salt and pepper. Add to veggies and toss. That is refreshng summer dish. I like the use of fresh basil. Very simple but sounds like a yummy recipe. Will have to try it when we get some fresh green beans. Another recipe I can make! Trying to eat more plant-based, thanks! Mmmmmm love how this is super easy and quick to make. I never know what to do with green beans when I’m given them and it never occured to me to try making a salad with it. I shall have to try this! I love my aunt’s green bean casserole and I definitely excited about trying this recipe. It looks delicious! 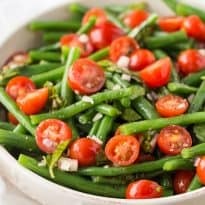 What a coinkydinky – I just got some fresh cherry tomatoes and green beans at the farmers’ market yesterday morning – this is a great way to use them. Thanks! Oh that is a pretty salad!! That looks so delicious. Thank you for sharing. I printed it out to try. Tomatoes and basil go so well together. Must be fresh basil for me. This sounds great. 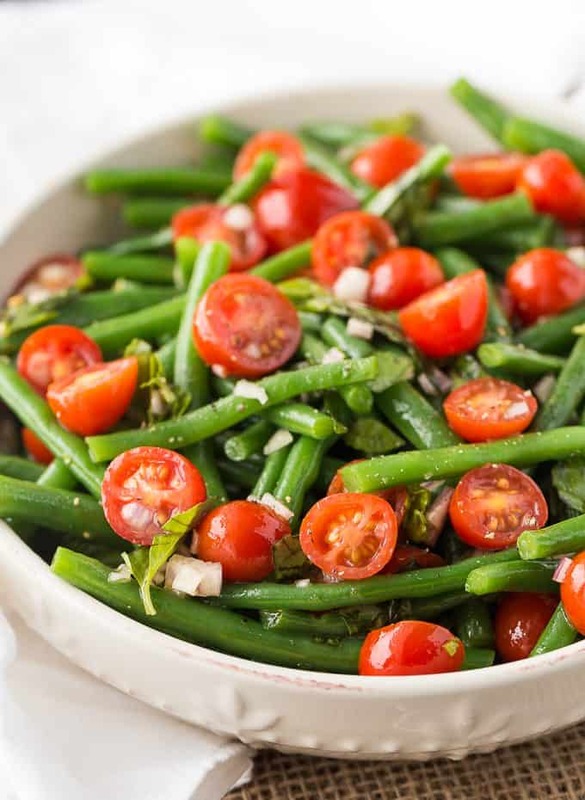 When I cook green beans to eat as a side dish, I usually cut up tomatoes and onions in them when I serve them. Sounds good, and now I can finally use that red wine vinegar I bought on a wine tour! Our green beans will be ready in our garden in about a week. This recipe looks so yummy I have to try it. I also have to try the Garden Vegetable Beef skillet too. I can’t wait! I love fresh green beans and this sounds delicious! Thanks for sharing! 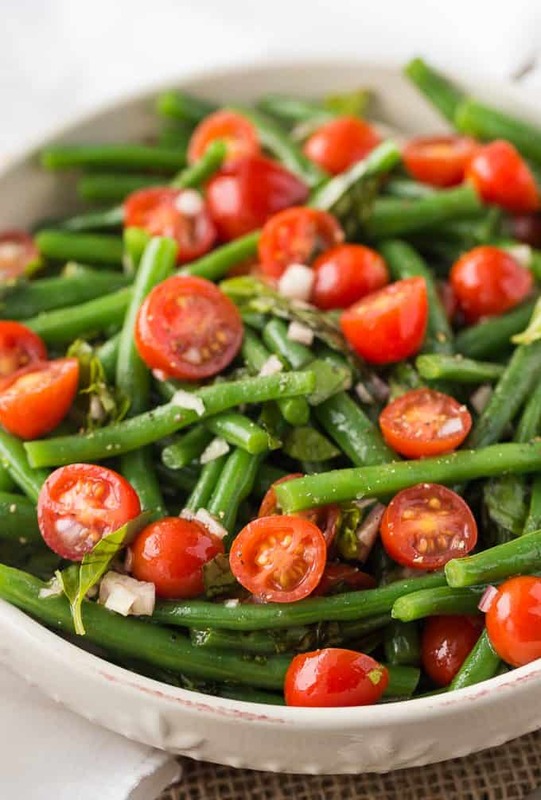 Green beans are still in season up here, so I’ll have to try this! Sounds yummy! This sounds refreshing, light, and wonderful. I will have to try it. I love broccoli and tomatoes and his would be a good combination too. I’d add onions with the shallots but lve the use of vinegar and oil. Such a summer-y recipe. I have Pinned to my Simply Stacie board. Maybe add some delightfull buffalo cheese or chevre on top? MMMM. Sounds like the perfect lunch salad and it’s a nice change up from lettuce!! I wanted to bring this in for lunch at work…you recommend keeping the dressing mixed on the side in a container or if made the night before to mix it into the green beans? I would mix it in the night before so it has a chance to marinade. This looks so yummy and healthy! I might add some sun-dried tomatoes too. This looks so yummy. I have never thought about adding tomatoes with that. I really have to make this! I made this the other day and it was very good! 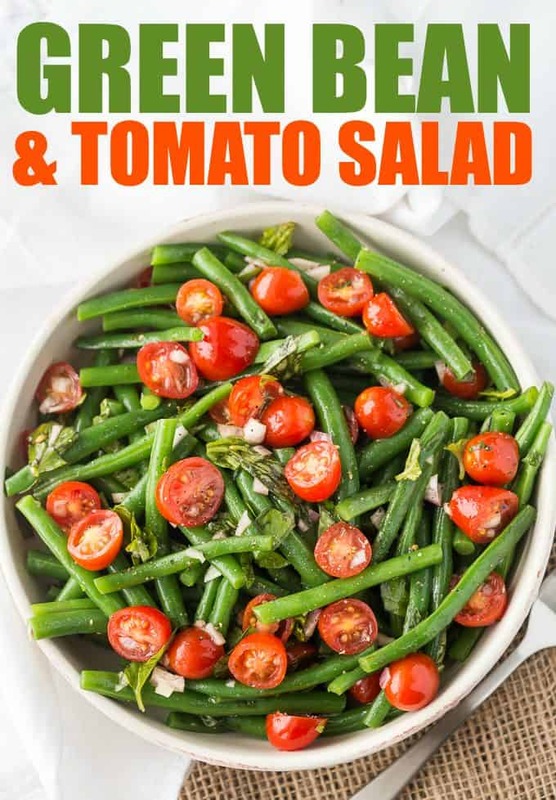 Since the tomatoes are finally getting ripe, and I have some of this week’s green beans in the fridge, I think that this would be a good recipe to make tonight. Thanks! Looks really good I’m definitely going to try it. I was wondering if adding pine nuts, almonds or another kind of nut would be good. Any suggestions? Any of those would be good. I also like pistachios and green beans. this is what I love, quick, simply and still delicious. I’ll be trying this one out for sure. Yum! 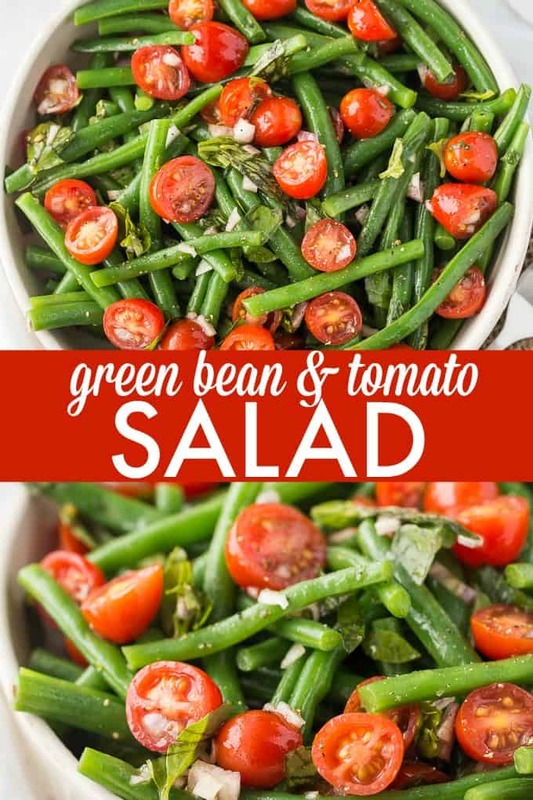 I also adore green beans… and cherry tomatoes and basil, so obviously I will be fixing this for my next meal. Obviously! Thanks for sharing the recipe! This looks delicious! Thanks for the printable recipe. I use green beans and potatoes when making Salad Nicoise, but I have to plan ahead for the prep on that one. Like you I have made the switch from so much broccoli, this will be a snap to put together. String beans are always my favorite. I love the contrast of the green and red colors in this dish. Green beans are definitely my favorite. So trying this recipe! Love fresh green beans and basil. This looks wonderful! What a beautiful and simple salad that’s something different than lettuce or pasta. The recipe looks and sounds delicious! Pinned. Thanks for linking up with us at the #HomeMattersParty this week! Now this is a great salad to make. Thank you for sharing at Dishing it and Digging it link party. We love having you. This is perfect for spring and summer. Yum! Pinned & sharing Thanks for joining the Inspiration Spotlight party. Shared on my FB page too.